Visual record of the works in this exhibition of self-portraits by fifty-seven artists. Co-published by The Gregg Museum of Art & Design, Raleigh, NC and Gallery Joe, Philadelphia, PA. Full color, 28 pages. Please contact The Gregg Museum of Art & Design regarding availability. Ms. Ahuja makes her New York solo debut with large paintings on paper of mythical beings, half woman, half animal, dressed in robes as brilliantly colored as the tropical fruit and flowers around them. Referring to the artist's African-American and East Indian background, the pictures turn marginality into a regal condition. The gallery also kicks off its new artist's book program with a display of sketch books by Mr. Ritchie, an artist based in Maryland. Each small book is filled with marvelous watercolors and all but indecipherable writing. Mr. Ritchie has been making such books for 30 years. They are extraordinary. BravinLee programs, 526 West 26th Street, 2nd floor, (212) 462-4406, closes tomorrow. Franz Bader, the legendary Washington art dealer and bookstore owner, nurtured local artists during his lifetime, and he continues to do so long after his death. The Franz and Virginia Bader Fund, established in 2001 in accordance with the will of Bader's widow, Virginia, awards grants to visual artists who are at least 40 years old and live within 150 miles of Washington, D.C. Since 2002, the Bader Fund has distributed $245,000 to 13 grantees. Two to three awards of between $15,000 and $25,000 are given each year. They can be used for any pur­pose, such as time off from a job, travel, working in other media, or remodeling a studio. The most recent grants, announced in December 2006, went to three artists, including, for the first time, two photographers. The recip­ients are photographers Frank Hallam Day, Washington, D.C., and Joe Mills, Annandale, Virginia, and Philip Geiger, Charlottesville, Virginia, a painter. The first exhibition of Bader Fund recipients' work was held November 8, 2006-January 26, 2007, at George Washington University's Luther W Brady Art Gallery. One hopes it will become an annual event! Michael O'Sullivan's glowing January 12, 2007, review in The Washington Post brought visitors to the show. Before then, O'Sullivan reported, the Bader prize winners, "seem habitually to have received less publicity than, say, that of the winners of the Trawick Prize or the Bethesda Painting Awards, both of which feature annual showcases devoted to the competi­tions' finalists." "The Franz and Virginia Bader Fund: Artists of the First Three Years" was organized by GWU University Art Galleries director Lenore Miller and Johanna Halford­ MacLeod, the Bader Fund's executive director. It featured oil paintings, works on paper, and sculptures by seven artists who received grants in 2002-2004. Among them were Kevin MacDonald of Silver Spring, Maryland, the late printmaker and painter to whom the show was dedi­cated, and Charles Ritchie, also of Silver Spring, whose specialty is drawings and prints. Also in the show were works by sculptor Yuriko Yamaguchi of Vienna, Virginia, and paintings by Steven Kenny of Washington, Virginia, and by Scott Noel, Alex Kanevsky, and Susan Moore, all of Philadelphia. O'Sullivan found that MacDonald's two prints and one painting were "inspired by the architecture and angst of suburbia" and "seem to throb with an otherworldly power." They have, he wrote: a pull that is, I think, universal in these meditations on memory, longing, and loss. A similar pull can be felt in Ritchie's works, especially in the two small drawings identified as-but not immediately obvious as-self­portraits. Gradually, it becomes apparent that the images are reflections in windows ... Like MacDonald's work, the built environments around us seem meant to be read as stand-ins for our own theatrically shadowed psyches. Ritchie has been with the National Gallery of Art, where he is currently Associate Curator of Modern Prints, for 27 years. He used his Bader grant to take time off so he could concentrate on a series of nocturnal self-portrait drawings and a mezzotint with soapground aquatint. He also filled nearly two handmade books with writing and color images. "I work fairly slowly and usually complete six to seven drawings a year," he said, "The Bader Fund grant gave me time to prepare for a show last year at Gallery Joe in Phil­adelphia that sold out. I credit the Bader Fund with giving me time and getting me straight into a really good gallery." Bader Fund recipients are chosen by a committee of nine, all friends of Franz and Virginia Bader. They meet in a hotel for two days, reviewing slides and CDs of submitted works, Lenore Miller said. There were 200 applicants for the three grants made in 2006. While great effort is made to solicit applications, Bader Fund director Halford-MacLeod worries that artists who are not represented by galleries or connected to art schools may not know about the Fund. Visual artists working in virtually every medium except film, video, and performance art are urged to apply. To date, painters predominate among the recipients, but printmakers, photographers, and sculptors are also represented. Bader was an accomplished photogra­pher and sold ceramic works as well as photo­graphs, prints, paintings, and sculpture in his gallery. The Fund wants its grantees to reflect his diverse interests, and Halford-MacLeod said, "We would love to hear from potters and other craftspeople." Since most of the Bader grantees applied more than once, Halford-MacLeod's advice to applicants is: "If at first you don't succeed, try again." In addition, artists known in one medium can apply for a grant in another. For example, Richard Weaver, a painter whose work has been exhibited at the Smithsonian American Art Museum, applied for-and won-a grant as a sculptor. "He submitted fabulous terracotta relief sculptures," Halford­MacLeod said, "We all loved them because they were so fresh and different from what people are making that finds itself in galleries." Franz Bader (1903-1994) was born in Austria, the son of a flour merchant and a painter. By the mid-30s, he owned the oldest bookstore in Vienna; however, after Germany annexed Austria in 1938, Bader, like other Jews, lost his business. With the sponsorship, through a mutual friend, of James Whyte, Bader and his first wife Tony managed to get visas to the U.S. in 1939. When they came to Washington, Bader worked in Whyte's well-known book­store, which sold modern art as well as foreign-language books and maps, until he opened his own art gallery and bookshop at 1705 G Street, N.W in 1953. Many well-known artists, including American print­maker Peter Milton (1930- ), exhibited at the gallery. Bader was also always interested in late-bloomers: he was the first Washington gallery to exhibit Grandma Moses, and the first commercial gallery to exhibit African­American artist Alma Thomas. Local artists who exhibited there included WPC artist-­member Barbara Kerne, the NGAs Mark Leithauser, and WPC board member Joan Root. "He nurtured artists and it is wonderful that his nurturing continues after his death," Root said. Bader not only exhibited her work, he also made a great effort to keep her in his circle. When Root decided to leave Washington for New York City, he offered her a small monthly advance so that she could con­centrate on her art. In return, she sent him some of her artwork and he would deduct her advances from the pieces he sold. The arrangement benefited both of them. The advances gave her the freedom to work on her art, and she sent him her best work, rather than sending it to a New York gallery. Root stayed in New York for 11 years and received Bader's advances for the first three years. She never knew if Bader made similar arrangements with other artists, but she suspects that he did. "He had faith in me," she said, "It made me more focused and very serious about my work." Root also reported that Bader had significantly helped her career: a series of lithographs that she produced sold well at his gallery and his encouragement led her to other important professional affiliations. "Franz brought printmaking as well as works by a wide range of artists to Washington, and he supported both in the sense that he showcased them in a city that then offered little of either," she said. Bader wanted that support to last. "As Franz grew older, he felt the need to have something continue ... after him, and that was his vision of the aesthetic riches that could be found in the places that too few people looked. It was for this reason that he and Virginia decided to establish a fund to help older artists ... bring their gifts to the world," Richard Conroy writes in a warm and appreciative memoir of Franz and Virginia Bader published on the Bader Fund website. Unlike those showcases, however, which have tended to include sometimes edgy work, "The Franz and Virginia Bader Fund: Artists of the First Three Years" is a pretty sedate show, featuring artists working almost entirely representationally. The lone exception is talented local sculptor Yamaguchi, whose art is known for its quiet, almost hermetic symbolism. Here, she's represented by two works: a wall of half-biomorphic, half-calligraphic shapes in translucent resin called "Metamorphosis/Transient" and a cloudlike ball of copper wire and resin bead-forms titled "Web #8." Part of a series, the latter evokes both the unknowability of the human brain and the World Wide Web. Of the other artists, whose work ranges from Kenny's tight surrealism to Kanevsky's brushy renderings of a fish, an apple tree and a female figure, the late MacDonald of Silver Spring stands out, and not merely because the show is dedicated to him, as a memorial of his death last year from cancer at age 59. Although you might want to call his work sedate, it's nowhere near sleepy. Spare and unhurried -- to use the words of artist, teacher and critic Janis Goodman, whose review of the artist's work on WETA television is featured on a gallery computer -- MacDonald's two prints and one painting inspired by the architecture and angst of suburbia seem to throb with an otherworldly power. In unpopulated streetscapes, such as the oil-on-paper "Mysteries (of Silver Spring) Girls Portion," which memorializes the now-vanished strip mall at Colesville Road and Georgia Avenue, MacDonald creates empty stage sets wherein the dramas of our own subconscious fears and desires play out. Having gown up mere miles from the site of "Mysteries," and having known the artist, I find special resonance in MacDonald's work, including the more generic houses depicted in the silkscreens "Memoria Suburbiae" and "Suburban Apotheosis." Still, there is a pull that is, I think, universal in these meditations on memory, longing and loss. A similar pull can be felt in Ritchie's works, especially the two small drawings identified as -- but not immediately obvious as -- self-portraits. Gradually, it becomes apparent that the images are reflections in windows. Bits of the frame are visible, as are half-glimpsed objects in the interior, but only dimly the artist himself. Like MacDonald's work, the built environments around us seem meant to be read as stand-ins for our own theatrically shadowed psyches. THE FRANZ AND VIRGINIA BADER FUND: ARTISTS OF THE FIRST THREE YEARS Through Jan. 26 at the Luther W. Brady Art Gallery, George Washington University Media and Public Affairs Building, second floor, 805 21st St. NW (Metro: Foggy Bottom-GWU). 202-994-1525. Open Tuesday-Friday 10 to 5. A two-person show in which both artists shine shouldn't be a rare occurrence. But it too often is, which makes the current Gallery Joe exhibition pairing the works of Nicole Phungrasamee Fein and Charles Ritchie an unexpected treat. Seeing Fein's and Ritchie's small but otherwise entirely unrelated watercolor pieces was a little like going to an ice-cream shop on a hot July day and trying to choose between such distinctive and likely competing flavors as peppermint stick and mango. In this particular case - art being ice cream - choice was not an option. I'd have ordered a scoop of each on one cone. Fein's watercolor paintings do, in fact, have something in common with ice cream. Her colors, like De Kooning's or those of the Washington Color School painter Gene Davis, are coffee, lemon, peach, strawberry, pistachio, and boysenberry, among others. And her arrangements of those hues into stripe paintings - she also paints grid patterns - suggest miniature horizontal versions of Davis' vertical stripe paintings. That other horizontal stripe painter, Agnes Martin, comes to mind, too. Both are superficial resemblances, though. Fein's practice of using the same pool of water to mix her paints - making each of her colors unrepeatable and unique - makes this work unpredictable and very much her own. 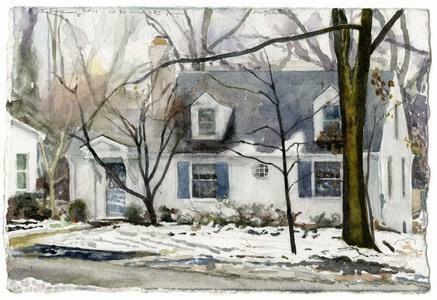 Ritchie's watercolors of nocturnal scenes in and around his Maryland home are spellbinding, not least because they were all painted at the same table in the same room of his house, and are all composed of tones of black and white, yet manage to be strikingly different from one another. For example, there are paintings from two separate suites of self-portraits here, each individual work depicting Ritchie's self-portrait as reflected in a window, but some of these portraits are as easy to recognize as others are difficult. I found myself lingering in front of several of his self-portrait paintings waiting for the image of his face to coalesce, which it eventually did, but never in the way I'd anticipated it would. Ritchie's paintings of straight and reflected images of the interior and exterior of his house often seem like composites of views, which I suppose, in effect, they are. The newest body of work in his show, a series called "Pages," juxtaposes Ritchie's tiny, almost indecipherable writing describing his experiences and dreams with images of his table at the window. These minute intimate pieces, though less photographic-looking than his other work, are reminiscent of trompe l'oeil painting. Gallery Joe, 302 Arch St., noon to 5:30 p.m. Wednesdays through Saturdays. Through March 25.